Nicholas Stuart was an ambitious young reporter working for the ABC in Thailand in the 1990s when a single moment seriously jeopardised his career as a foreign correspondent. At age 29, this star reporter was involved in a car collision, and sustained a catastrophic brain injury. This event greatly changed his personality, and affected his career. Following the crash, Nicholas had to face a new life that was different to what he had known. "The injury completely transfigured my body. It also changed my mind. I needed to learn that I was a new person now. I wasn't the old, brilliant Nick Stuart," he says. Now more than 25 years later, Nicholas Stuart is a columnist with Fairfax Media and the author of three books. 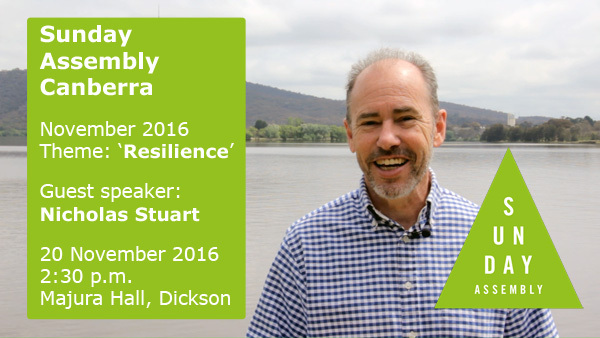 Nick will be the keynote speaker at the November 2016 Sunday Assembly Canberra, helping us to learn and understand from his experiences. As usual, we will curate a whole event around this theme of Resilience, including readings, personal reflection and songs. Heads-up from the choir: get ready to sing some "Eye of the Tiger"! See you Sunday 20 November at Majura Hall, Dickson. Please arrive by 2:15 for a 2:30 p.m. start. Visit our event page to RSVP for tickets.